You want to build an amazing front end user experience and mobile application — I get it. Let’s say you want to build something that delights your users, creates a loyalty program, or integrates with your existing inventory systems. Let’s say you want to build a product that calls on data distributed across all of your fragmented internal systems. Get your back end in line before touching the front end. 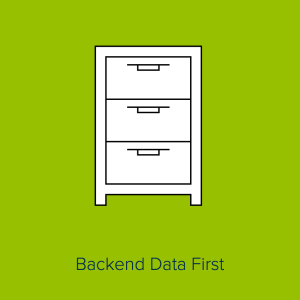 Is the back end ready for a compelling front end experience? This is the golden question and the primary mistake that marketers run into when attempting to build engaging mobile experiences. If you are in the Fortune 1000 and want to build a new mobile application that incorporates customer information, databases, or internal systems, you need to prepare the proper API and web service layers to translate and call the correct data for your applications. This is a lot of work and takes time and consideration, but it’s usually worth doing to scale and implement a valuable front end experience. It also begins to future proof your data layers for continuous product iteration. Don’t get too far on the front end vision without checking the back end. I’ve seen too many teams design and envision a beautiful front end experience before checking if it’s possible to dynamically interact with the data. This typically comes from marketing teams operating in silos from development, but it can also come from IT teams misunderstanding the parameters and best practice of mobile. Don’t make the Mobile Product Mistake #5 — make sure to do a web service or API audit before dreaming about building the next Uber for your business. This is one part of a series called 9 Mobile Product Building Mistakes. Stay tuned for the next Mobile Product Building Mistake #6: Thinking user interface design is the same as user experience design.